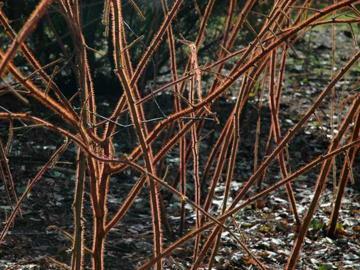 Long arching, orange-red stems are covered in fine thorns, and are most attractive in winter. Small star shaped, pale pink flowers open from bristly reddish buds in summer. Edible red fruits. Any reasonable, moist, well drained soil in sun or part shade. From seed, by layering or division of suckers. 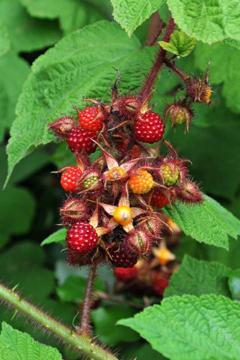 The raspberry-like fruits are edible raw or cooked and have a good sweet flavour. The bare stems make an interesting winter feature.